Managers Neil Warnock and Billy Davies were angered after Crystal Palace's Clint Hill and Nottingham Forest's Paul Anderson clashed in their 1-1 draw. Hill appeared to elbow Anderson during the match but was unpunished, although he was booked for squaring up to Chris Gunter in the subsequent melee. "It was a red card and when Neil Warnock doesn't complain to you then you know he also knows," said Davies. Warnock argued: "It was a yellow card. It was reckless but not deliberate." When the incident took place on the stroke of half-time, Davies leapt off the bench to protest. The atmosphere became even more charged when the Crystal Palace radio commentary was fed through the stadium public address system just as the commentator described the visiting manager as being "out of his pram". Hill and Forest right-back Gunter were booked but the Palace man escaped further punishment after referee Graham Horwood decided his challenge on Anderson was not deliberate. "He (Warnock) is a very fortunate manager and he (Hill) is a very fortunate player because it was a very blatant elbow in my opinion," said Davies. "The referee says there was no malicious intent which I find quite staggering. Paul Anderson is okay, but he's a lucky boy. The medical people wanted him to come off straight away and he didn't look too comfortable. "I was out of my pram because I'm trying to protect my player, 21 years of age who had just been hit in the head. And I'm really sorry if I've upset this tannoy guy. Tell him I'm sorry!" But Warnock believes Horwood got his decision right and was furious to discover Davies had described his side as physical and hard to handle. "I think that's a disgraceful statement. 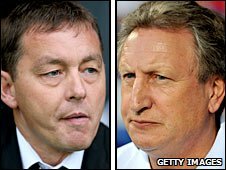 If I'd spent nearly £4.5m on players, I'd probably say a bit less than that," said Warnock. Forest will be keen to avoid a Football Association investigation having already been fined £25,000 - of which £10,000 is suspended - for failing to control players and officials after beating Derby in August. The sanction will be automatically activated if Forest are found guilty of similar offences before the end of the 2010-11 season.